That sounds kind of radical ... and I like it! "Empowering" quotes about the importance of loving yourself are everywhere these days. 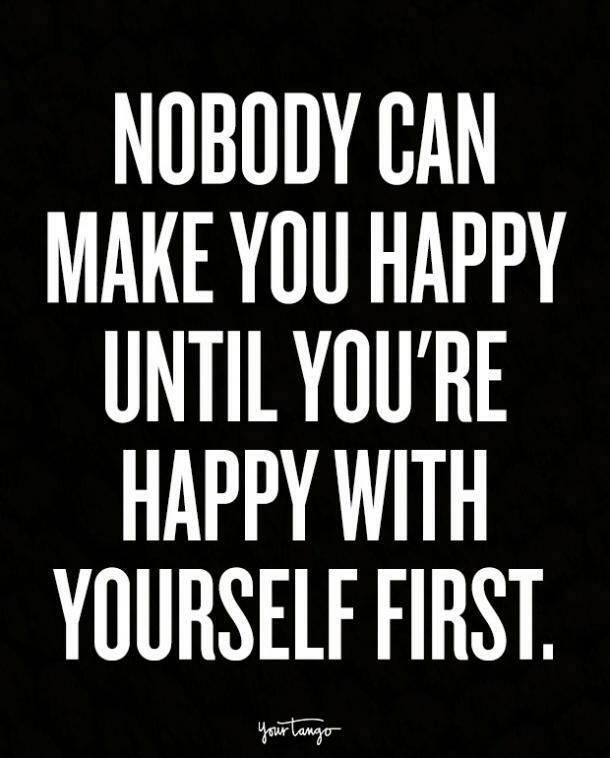 "Nobody can make you happy until you're happy with yourself first." "No one is going to love you if you don't love yourself." Those are just two of my personal favorites — if we define "personal favorites" as "quotes I most want to hunt down and remove from across the entire Internet as swiftly and permanently as possible." No one ever loved themselves MORE by being told they don't love themselves ENOUGH. Because what that translates to is this: Hey, dummy. You aren't doing this well enough. You aren't loving yourself enough. 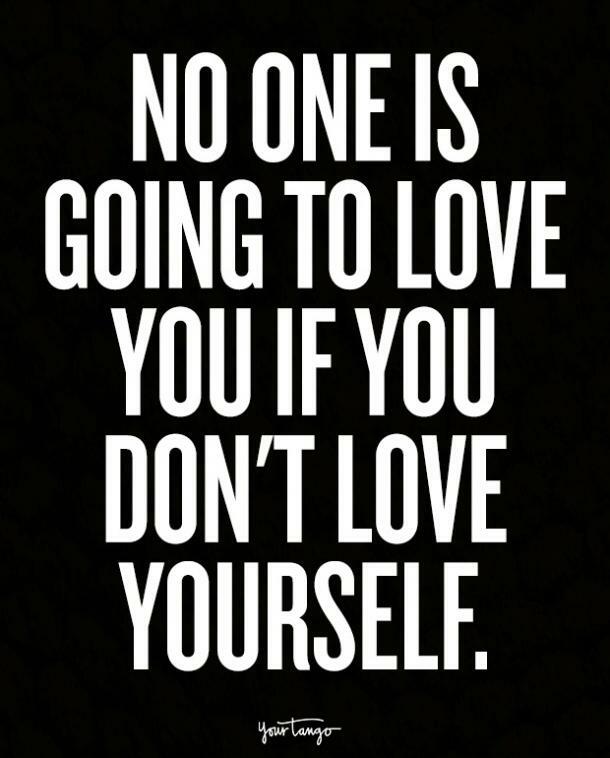 Your love for yourself isn't good enough. YOU aren't good enough. AND... Because you aren't good enough to even love yourself, you aren't good enough to be loved. BAD GIRL. When someone with low self-esteem, who already has trouble finding something within themselves to love, hears that message, the list of positive qualities they DO ascribe to themselves gets a tiny bit smaller. Again. I'm someone who never struggled with the concept of loving myself until I became aware that loving myself was something I should do. After a difficult divorce that concluded an even more difficult marriage, I jumped into another unhealthy relationship. And then into another. And then I started pondering the question, "Why do I do this to myself? ", as people who find their way out of codependent, emotionally abusive relationships tend to do. This being the era of Pinterest, I spent hours gazing at quotes like those above, wondering to myself, "But how am I supposed to do that? What does it even mean to 'love yourself'? How do people learn to do that? What does loving yourself look or feel like?" I gave these thoughts a decent amount of energy, both on my own and in therapy, but didn't come to any clear answers. I have more than enough on my shoulders to feel like burdening myself further with such a seemingly impossible feat and basically decided to say, "F**k it." I have kids to love. I have work to love. I have friends and family to love. That's enough for now. Until a few months ago, when YourTango's founder and CEO, Andrea Miller, invited our team to join in a 60-day challenge of "Radical Acceptance" to coincide with the release of her new book Radical Acceptance: The Secret to Happy, Lasting Love. I decided to put my eggs of hope back into the proverbial basket and give it a shot. I have to be brutally honest (because that's really the only way I know how to be, for the good or the bad). I may have rolled my eyes once or twice as I opened up the book. I am nothing if not a cynic, and as much as I love many people in the helping professions, I often find the cheese-factor in most self-help type books annoying at best and infuriating at worst. Except that, as I actually began to listen to what Andrea had to say, it just made sense. Something making sense to me is pretty much a HUGE deal. Understanding the logic behind things is the typical key to my ability to accept them. Someone ghosting me absolutely kills me ... because it just doesn't make sense. There's no rhyme or reason. Someone getting mad at me drives me up a wall ... until they explain why. Then I will do my best to apologize and make amends. Someone telling me I can't do something only makes me want to do it more ... until they explain why that decision/rule/law/boundary is in place. And then I'm good to go. Once any of these things — or anything else I just don't "get" — is made clear, I am totally, completely, 100% on board. What I found reading Radical Acceptance is that not only do Miller's words make sense, but her concept makes sense as well. 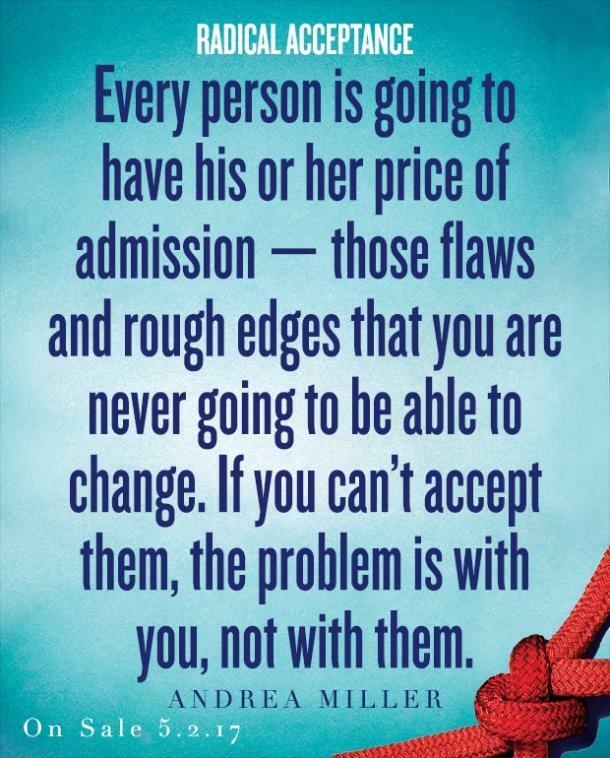 "Every person is going to have his or her price of admission — those flaws and rough edges that you are never going to be able to change. If you can’t accept them, the problem is with you, not with them." See! That. Makes. Sense. Especially in terms of love for yourself, or in this case, my love for myself, because in order to find that self-love, I have to accept myself, even if one of the "flaws" I may never change is not loving myself. Can I love myself? DO I love myself? I really don't know the answers to those questions. The whole idea just doesn't completely add up for me. Can I "radically accept" myself? YES! That I can do! THAT makes sense to me! Do I "radically accept" myself? I'm working on it. I'm certainly getting a whole lot closer. And you know what? That actually makes me feel like I love myself a whole hell of a lot. If I can fully accept myself for who I am, what I do, and whatever I may feel in any given moment, what's not to love about me — even in those moments when I absolutely do NOT love myself? Let's be real. Unless you have a full-fledged, pathological case of Narcissistic Personality Disorder, no one, not one single one of us, loves everything about themselves all of the time. Even narcissists don't authentically love themselves. They desperate seeking out the love and attention of others so they will no longer feel the deeply painful hatred of themselves that they do. I understand the positive intentions behind the "love yourself" movement. I truly do. And I appreciate that. For me, I've had enough of trying to accomplish the impossible, especially when it comes to fixing people, so I think it's time I stopped trying so hard to believe I can "fix" myself. Choosing to radically accept myself? That I will gladly do. And THAT is some seriously real self-care.